A few years ago Brad and I made a run down to the Talimena Drive. Oklahoma's only National Scenic Byway is located in the Ouachita National Forest and offers some beautiful winding roads. Most of the twisties meander across Winding Stair Mountain, part of the highest range between the Rockies and the Appalachians. We headed down with cameras and gear to try our hand at shooting some video for a zany idea we had called Two Wheel Oklahoma. Unfortunately my dime store camcorder wasn't up to snuff, and those early videos look pretty lame compared with what we're doing today. But we shot some great photos, rode some great roads, met some great people and had a heck of a good time. 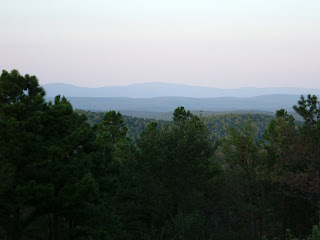 We unknowingly picked a great weekend to go- cooler weather and less traffic on the scenic Talimena. In a week or so the leaves would start turning and the twisties will be crowded with Land Yachts full of gawkers. The lack of traffic was almost spooky– like we had the place to ourselves! We took a meandering route south of Tulsa on US-64 and eventually to Oklahoma state highway OK-2. 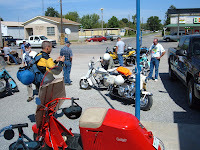 When we passed through Kinta, Oklahoma near the Sansbois Mountains we noticed a slew of scooters milling around the VFW hall. Turned out the Oklahoma Cushman Club was having a big get-together. We stopped to ogle vintage scooters of all colors and varieties while enjoying the pucka-pucka-pucka of all the little flatheads. I was surprised how many different models and engine variations Cushman had offered. They weren't just there for show either- these folks were riding them! Just as we arrived a large group was heading out to make a loop around Kinta to Wilburton and back. It was pretty cool seeing all these scooters on the highway. From there we headed south, following OK-2 past Robber's Cave State Park and on toward our final destination: Wister State Park south of Poteau. After setting up the tents at a campsite on Lake Wister we had a quick bite to eat in Poteau. Afterward we made a quick loop around Heavener and a portion of the Talimena Scenic Drive, or "Drive" as the locals call it. At one scenic turnout we marveled at the rolling hills stretching from one row of mountains to the next. The once majestic mountains of Southeastern Oklahoma have been beaten down by the millennium, but to my eye, they still offer a great view. The ride back to Wister was purdy as a pitcher. As the sun set I tried to keep my mind off the danger of deer darting across the road (a constant threat but greatly multiplied during the twilight hours). We cruised along and enjoyed the ride before crawling into our tents for the night. The next day we headed toward Arkansas. 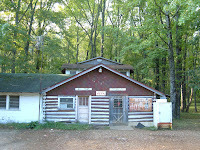 At the Queen Wilhelmina Lodge we ran into several other motorcyclists. Some of them were from Dallas and stood shivering as the wind howled through their light mesh jackets. I remarked how different this landscape must seem from anything near the DFW Metroplex. They heartily agreed. It reminded me how great it is to live only a couple of hours away from such a great road! From there we headed down to a local beer joint called the Stateline Tavern. There's a great road near the Wilamena that takes you down the hill through a tightly twisting tunnel of trees to a U.S. highway that parallels the Drive. Follow US-271 back west, toward Oklahoma, and you'll soon see a parking lot carpeted in bottle caps. Tourists visiting the Wilhelmina for the first time discover Mena, Arkansas is in a dry county. So anyone hoping to wet their whistle after a long ride will have to visit the Stateline Tavern on US-270. At least it's the closest place to the Queen Wilhelmina Lodge to buy a beer- and possibly the most enjoyable. This is one of those classic roadside gems. The building actually rests on the state border- the pool table is in Arkansas and the bar is in Oklahoma. So you can buy a beer, then "import" it to Arkansas and enjoy a game of billiards. Visiting with the locals is also part of the experience. Unfortunately our visit this time was uneventful. I snapped a few pictures and we headed on back to Wister to pack up and head back to Tulsa. It was another great trip to the Talimena and Southeastern Oklahoma. One we hope to repeat for an upcoming episode of Two Wheel Oklahoma! This is an awesome ride! Great article!